See, in Hong Kong they understand food. I sat at my table pondering all of this while grinning at the sight of the pork-loving child. Then my happpiness was replaced by confusion and rage when I remembered that Legume had recently taken one of the best appetizers that they ever did off the menu due to lack of demand. Said dish started with pork belly with which they made a confit. 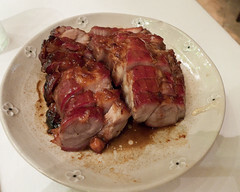 Confit, of course, is when you preserve fatty meat like duck or pork belly in more fat. They then roast the meat for service and put it on top of one of their signature perfect green salads with a simple but great vinegar and oil dressing. Something much less popular but equally as good is the oven roasted pork belly appetizer. We prepare this much like our duck confit – curing it overnight, cooking it slowly in duck fat for several hours, and letting it cool and age in the duck fat until it is roasted in the oven to order. As much as we love it, this will be its last week on the menu due to its unpopularity. So here is my question: how can this fabulous dish be unpopular? How can people possibly not be beating down the doors to order and consume this? It is a tiny little piece of heaven on a plate and now I can’t order it anymore because the rest of the population in this god-forsaken two bit loser town can’t be bothered to figure this out and order the damn thing? This cannot stand. The people who have brainwashed our population into their irrational fear of pork fat must be made to account for their sins. We need to take action now to restore the pig to its rightful place at the top of the favorite foods list of all of our kids and our kid’s kids. Nothing less than the future of good food is at stake. Make your voice heard now. Stand up for what all that is right and good in the world. Do it now before it’s too late. The next thing you know, there will be nothing in the store but turkey bacon. For the record, the two best appetizers I ever had at Legume were the lamb’s tongue with potato salad and the braised veal cheek on top of polenta. I raved about these before. Also, I feel the need to note there that the pizza we got is the most perfect pizza of all time. It’s a bacon and egg breakfast on a pizza. That is all. A couple of days ago, I was in a local grocer around here (DC), and talked with a cute girl who was buying a half dozen containers of lard in order to make a confit. It warmed my heart to see someone so gloriously unafraid to make and eat good food, and so rare to see someone actually using lard.